Home » Blog » Uncategorized » They’re HERE!!!! The full order of printed books has arrived!!! I now have ALL the rewards in house, and can begin sorting, packaging and with any luck, MAILING REWARDS FOR KICKSTARTER BACKERS THIS WEEKEND!!!!! Remember, for those who responded to the survey that you wanted books signed by as many creators as possible, I’ll be taking the books with me to New York Comic Con, Oct 6-9, to make that happen. So, those orders will get packed and shipped upon my return the week after. Everything else SHOULD ship out early next week, a shade later than promised but only by a week or so. Thanks SO MUCH for your patience on this slight delay. In the interest of full disclosure, we decided to print the books with a different printer than originally planned, and I think we got a MUCH better product because of that decision. HUGE THANKS to the folks at Keness for all their help. They are the BEST!!!! More news on how to get a copy if you MISSED the Kickstarter coming soon! Previous post Gravity Matters drops on Comixology Submit!!! 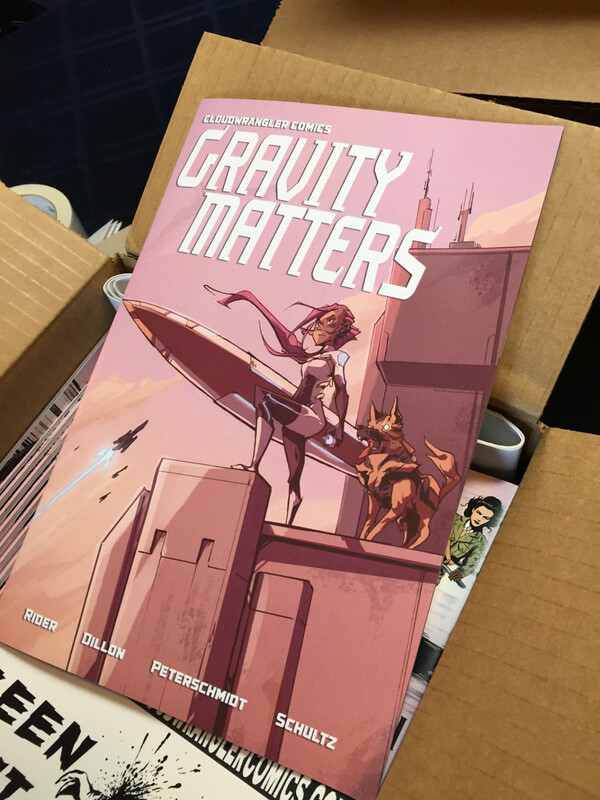 Next post Coming appearances by the Gravity Matters Team!